Bible Studies in the Live of Paul, Historical and Constructive: The book of Acts shows in a very graphic way the rapid growth and marvelous progress of Christianity in the midst of great opposition. We see in process of fulfillment the promise of Jesus Christ to his disciples that they should receive power after the Holy Ghost had come upon them and that they should be witnesses unto Him "both in Jerusalem and in all Judea and in Samaria and unto the uttermost part of the earth." Those were earnest times and full of stirring events, when men went forth to conquer a hostile world not with swords, but by the preaching of a gospel of peace and good will. As soon as this proclamation was made in Judea and Samaria a new instrument was chosen by Jesus Christ, in Paul, to carry His message to the uttermost part of the earth. He thus became at once the chief character in the larger work of planting and developing churches outside of Palestine. The study of Paul's life shows the difficulties encountered, the doctrines taught, and the organization perfected in the early churches. "We here watch the dawn of the gospel which the Savior preached as it broadens gradually into the boundless day. "Bible Studies in the Life of Paul is designed to follow the author's Bible Studies in the Life of Christ and to show the work of the Great Apostle in carrying the gospel to a Gentile world. The aim is to present the work of Paul in a constructive and historical way. While there has been a careful consideration, on the part of the author, of disputed questions, only conclusions upon which there is a general agreement amongst scholars, and which can be consistently held, are presented. The great main facts of Paul's life and work stand forth unchallenged and the emphasis is placed upon them. 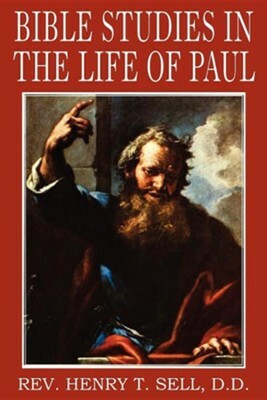 This book is divided into three parts, Paul's preparation for his work, his missionary journeys, and his writings. This is a text book, and, with the analysis of each study and questions, is prepared for the use of normal and advanced Sunday-school classes, teachers' meetings, schools, colleges, and private study. This is the sixth book of the kind which the author has prepared and sent forth. The large favor with which the other books have been received, and the desire, first of all, of making the life and work of Paul even better known, have been the motives which have led to its preparation.CHICAGO, ILL.HENRY T. SELL. I'm the author/artist and I want to review Bible Studies in the Life of Paul.